This nocturnal frog is unique in having clawed toes. Lacking a tongue, it uses these specialized toes to stuff food into its mouth. 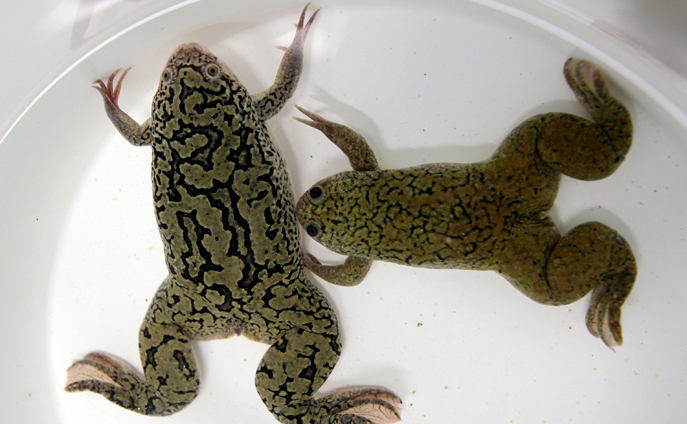 The African clawed frog lives in water and is unable to hop on land. They have been introduced in many areas. Biologists believe they are the origin of the spread of chytrid fungus, an infectious disease that affects amphibians worldwide. It causes sporadic deaths in some populations and 100% mortality in others. Their skin produces a type of antibiotic which may have medical uses for humans.